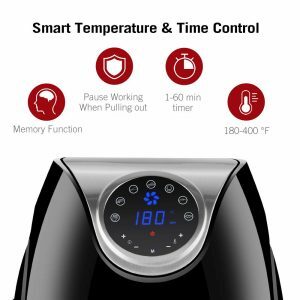 TaoTronics TT-EE004 is a 1500 watt power (120V~60Hz) modern air fryer/oven with a 4.2 quart (4 liter) capacity with a removable basket, a LED touchscreen display and 7 presets for cooking different items. You’ll get a basic cookbook in the box with instructions on time and temperature settings for cooking different ingredients and meals. The basket inside has the convenient nonstick coating. It is easy to clean with the dishwasher safe parts. When you first take it out of the box there is a cardboard that you need to remove in the main body underneath the heating elements. Then you can turn the air fryer on and start using it, or this may cause fire. With the rapid air circulation it can make healthy main dishes and fried snacks without needing to use any oil quickly for up to 4-5 people at once. The cooked or prepared meals will have about eighty percent less fat than normal. You’ll find the intuitive icons for custom presets, including steak, ham, potato chips, shrimps, drumsticks, fish and cake. With the smart temp and time control the temperature can be set between 180 and 400 degrees Fahrenheit and the time between 1 to 60 mins on the digital display panel. It will beep five times when it’s done with cooking and your meal is ready. The removable basket has a cool touch handle and a button guard so there won’t be any detachments by accident. It is an ETL approved and FDA certified product that is safe to use overall. It is made of stainless steel and food-grade solid plastic without any harm for human health. There is an anti-slip base, a non-stick basket, automatic shut-off, temp control and indicator light. In the box you’ll find the TaoTronics 4 Liter Air Fryer, a user manual and a recipe book. It is plug and play type, easy to use air fryer that doesn’t need any assembly. Black TaoTronics 4.2Qt Cooker weighs 12 pounds and measures 13.6 x 11.3 x 12.8 inches. One of the customers commented on the difficulty of putting the basket in and out of the air fryer and latching and unlatching and that it didn’t feel like a smooth process. And how the presets didn’t set the time and temp automatically when you press the buttons. This doesn’t seem to be the case with the other reviewers and they must have received a faulty product. TaoTronics Air Fryer cooks evenly and in a much shorter time than a conventional oven and in a much healthier way than the deep fried. The grease drains through the basket and what you get is still moist on the inside and crispy on the outside and flavorful and healthy overall with little or no added oil. 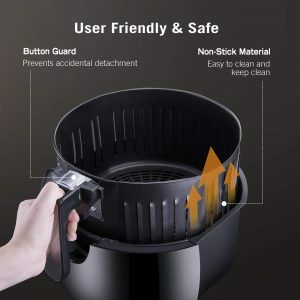 The bucket and the basket are very easy to clean. The digital display panel is easy to read and operate with the touch buttons. It looks good- is easy on the eyes and works well overall for what it is designed. You may like this space saving air fryer with a narrow but high profile even more if you have limited space on your kitchen counter. The price seems low and you’re getting a decent value for money. *TaoTronics has a variety of products including home goods and appliances, audio devices and LED lighting solutions, to help customers’ lives easier.